The study, called the Program for the International Assessment of Adult Competencies, found that it was easier on average to overcome this and other barriers to literacy overseas than in the United States. Researchers tested about 166,000 people ages 16 to 65 in more than 20 countries and subnational regions. The test was developed and released by the Organization for Economic Cooperation and Development, which is made up of mostly industrialized member countries. The Education Department’s Center for Education Statistics participated. The findings were equally grim for many European countries – Italy and Spain, among the hardest hit by the recession and debt crisis, ranked at the bottom across generations. Unemployment is well over 25 percent in Spain and over 12 percent in Italy. Spain has drastically cut education spending, drawing student street protests. But in the northern European countries that have fared better, the picture was brighter – and the study credits continuing education. In Finland, Denmark, and the Netherlands, more than 60 percent of adults took part in either job training or continuing education. In Italy, by contrast, the rate was half that. As the American economy sputters along and many people live paycheck-to-paycheck, economists say a highly-skilled workforce is key to economic recovery. The median hourly wage of workers scoring on the highest level in literacy on the test is more than 60 percent higher than for workers scoring at the lowest level, and those with low literacy skills were more than twice as likely to be unemployed. -Americans scored toward the bottom in the category of problem solving in a technology rich environment. The top five scores in the areas were from Japan, Finland, Australia, Sweden and Norway, while the US score was on par with England, Estonia, Ireland and Poland. In nearly all countries, at least 10 percent of adults lacked the most basic of computer skills such as using a mouse. -Japanese and Dutch adults who were ages 25 to 34 and only completed high school easily outperformed Italian or Spanish university graduates of the same age. -In England, Germany, Italy, Poland, and the United States, social background has a big impact on literacy skills, meaning the children of parents with low levels of education have lower reading skills. This test could suggest students leaving high school without certain basic skills aren’t obtaining them later on the job or in an education program. The United States will have a tough time catching up because money at the state and local level, a major source of education funding, has been slashed in recent years, said Jacob Kirkegaard, an economist with the Peterson Institute for International Economics. “There is a race between man and machine here. The question here is always: Are you a worker for whom technology makes it possible to do a better job or are you a worker that the technology can replace?” he said. For those without the most basic skills, he said, the answer will be merciless and has the potential to extend into future generations. Learning is highly correlated with parents’ education level. “If you want to avoid having an underclass – a large group of people who are basically unemployable – this educational system is absolutely key,” Kirkegaard said. Adults can learn new skills at any age and there are adult-geared programs around the country, Perin said. But, she said, the challenge is ensuring the programs have quality teaching and that adults regularly attend classes. “If you find reading and writing hard, you’ve been working hard all day at two jobs, you’ve got a young child, are you actually going to go to class? It’s challenging,” Perin said. Some economists say that large skills gap in the United States could matter even more in the future. America’s economic competitors like China and India are simply larger than competitors of the past like Japan, Carnevale said. Even while America’s top 10 percent of students can compete globally, Carnevale said, that doesn’t cut it. China and India did not participate in this assessment. “The skills in the middle are required and we’re not producing them,” Carnevale said. Respondents were selected as part of a nationally represented sample. The test was primarily taken at home using a computer, but some respondents used a printed test booklet. -Japan, Finland, Canada, Netherlands, Australia, Sweden, Norway, Flanders-Belgium, Czech Republic, Slovak Republic, and Korea all scored significantly higher than the United States in all three areas on the test. -The average scores in literacy range from 250 in Italy to 296 in Japan. The US average score was 270. (500 was the highest score in all three areas.) Average scores in 12 countries were higher than the average US score. -The average scores in math range from 246 in Spain to 288 in Japan. The US average score was 253, below 18 other countries. -The average scores on problem solving in technology-rich environments ranged from 275 in Poland to 294 in Japan. The US average score was 277, below 14 other countries. Makes you wonder where the powers that be desire to take us? Hopefully they want to take us to Australia. I've always wanted to go there ever since I learned in public school, about the fascinating animals native to Australia. Like lions, cheetahs, African elephants, polar bears, bison, timberwolves. You see, my public education didn't go to waste! Lol B.W. I don't think many will get the CCR reference. What's a CCR, Suzie Q? RickD wrote: What's a CCR, Suzie Q? The CCR is a car made by Koenigsegg of Sweden. I'm not a dumb American so I know these things. Last edited by Furstentum Liechtenstein on Wed Oct 16, 2013 11:30 am, edited 1 time in total. Don't forget all those Arctic penguins and Mongolian alpacas! I hear they're really cool! "If you know what I mean." Without quibbling your comment, B.W., the other side of the coin is that where, maybe 50 or 100 years ago, people in lower economic classes tended to revere education and push their children to succeed, many/most modern "poor" people in the US no longer do, and even denigrate education and achievers. Public education in the US has many problems - there are no "if you just do this one thing" magic-bullet solutions - this being one. And teachers bear the brunt of this cultural attitude daily. We homeschooled our children, but I thoroughly respect PS teachers who persevere in pursuing excellence in their teaching and their students. Who says Americans are dumb? 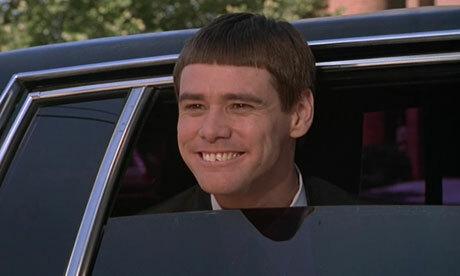 I resemble, I mean resent that..
Jim Carrey is Canadian, you dumb American!